Rip-Roaring Fun | The Kids Beat | Kids VT - small people, big ideas! 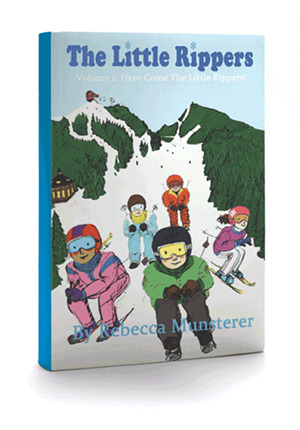 Ski season is almost here — and Norwich author Rebecca Munsterer knows kids are just as pumped for it as adults are. Her new children's chapter book, The Little Rippers, is the first in a slopeside series about Max and Molly Beckett. Enrolled in a kids' ski class at the fictional Powderhound Mountain in Vermont, the brother and sister learn about friendship and teamwork when a blizzard sends the group down the wrong ski trail toward a mysterious snowmobiler. Young readers will enjoy this fast-paced mountain adventure, featuring moguls, black-diamond trails and the Sunday Funday ski race. Let it snow. "The Little Rippers" by Rebecca Munsterer with illustrations by Ryan Hueston. Published by Novel Nibble Publishing, 84 pages. Paperback available at Amazon.com and the Norwich Bookstore. Visit thelittlerippers.com for more information.